© Daghino et al. ; Licensee Bentham Open. The tibial pilon fractures represent a complex therapeutic problem for the orthopedic surgeon, given the frequent complications and outcomes disabling. The recent medical literature indicates that the best strategy to reduce amount of complications in tibial pilon fractures is two-stages procedure. We describe our experience in the primary stabilization of these fractures. We treated 36 cases with temporary external fixation in a simple configuration, called "tripolar": this is an essential structure (only three screws and three rods), that is possible to perform even without the availability of X-rays and with simple anesthesia or sedation. Temporary stabilization with external fixator in ‘tripolar’ configuration seems to be the most effective strategy in two steps treatment of tibial pilon fractures. These preliminary encouraging results must be confirmed by further studies with more cases. Keywords: Ligamentotaxis, simple sedation, temporary external fixation, tibial pilon fracture, tripolar configuration, two stages treatment. The tibial pilon fractures, characterized by constant and predominant involvement of the plafond and the consequent impairment of the ankle joint stability, raise a complex therapeutic problem for the orthopedic surgeon, given the frequent complications and outcomes disabling [1-3]. In the recent medical literature, much emphasis is placed on the ideal timing of surgery and the waiting period for evaluation of possible evolution of soft tissue conditions ; the two-steps strategy treatment, with immediate temporary external fixation followed by definitive treatment after 5-14 days, is now considered as the most effective approach to treat these fractures, ensuring lower incidence of complication respecting soft parts.In order to reduce the invasiveness of this approach, the ‘tripolar’ external fixator was designed to minimize the impact of the first surgical time. This surgical technique is simple and rapid, with a reduced equipment: self-drilling and self-tapping cortical screws in stainless steel (positionable without scopic control, motorized-drilling the first cortical and manual progression, to have a sensitivity to feel the crossing of second cortical) and quick closure clamps (for a rapid tightening without loss reduction). The gripping points are represented by screws of diameter of 6 mm: on the tibial crest at diaphyseal or proximal metaphyseal level, on the medial side of heel bone, and a third screw (with reduced thread diameter of 4 mm) on the medial basis of the 1st metatarsal. At this stage, it is possible to assemble the structure to form a triangular frame, with distal base connecting the heel and the metatarsal screw with a transverse rod, which in turn is connected to the tibial screw with two clamps; and with the clamps semi-open, it is possible to carry out ligamentotaxis with a manual traction on the esoskeleton base, to realign the fracture and distract the joint; this distraction is subsequently maintained by tightening the clamps, and thus completing the assembly (see Fig. 1). All cases were treated with Hoffman II external fixator (Stryker®, Mahwah, NJ, USA) or Prefix System (Orthofix®, Bussolengo (VR), Italia), but the tripolar configuration can be realized with any external fixator with quick closure clamps. We propose a retrospective review of cases treated with the tripolar system at the CTO Hospital in Turin; all cases were evaluated on radiographs performed in emergency room by type of fracture according to the AO classification  and with the Gustilo classification in case of exposure; we considered the time elapsed between trauma and the temporary stabilization with external fixator and the time elapsed between the first surgical time and the subsequent definitive synthesis, the surgical time for primary stabilization and the type of anesthesia used, the possible intraoperative and post-operative complications, the type of definitive treatment and the possible influence caused by this configuration of external fixation on the choice of the final treatment. All data were derived from the results reported in the medical records: the revision was implemented by a single independent evaluator, who was not involved in surgical procedures performed. Temporary external fixation, called "tripolar". In the period between January 1, 2010 and October 30, 2013 were fixed 36 implants in 35 patients with a fracture of the distal tibial metaphysis and epiphysis, in 24 of them associated with fibular fracture: in 16 cases, one of which bilateral, they were injuries occurred in polytrauma , in 20 cases isolated skeletal injuries. The average age of patients in this group was 46,9 years (range 28-79): 25 were male and 10 female. According to the AO classification, in 27 cases the fracture was properly articulate (including 8 43C1, 5 C2, 14 C3, 2 B1, 1 B2, 1 B3) in 9 cases were periarticular fractures, (3 43A1 and 6 A3). Eight cases had exposure: 4 Gustilo I cases and 4 Gustilo II cases (see Table 1). In Table 2 are reported the results of the analyzed variables: the minimum time interval between the trauma and stabilization with this system was 3 hours, the maximum of 144 hours; this occurred in the only case with bilateral lesion, secondarily transferred from another hospital, where the lesions were initially contained with temporary splint immobilization. 28 of 36 implants were performed without the fluoroscopy; in 8 cases the patient was subjected to narcosis, in 2 to spinal anesthesia, the other was just the simple sedation with propofol e.v. at a dose of 2 mg/Kg; the mean operation time was 10,9 minutes (range 3-15). In the 16 cases in which CT was performed subsequently to the positioning of the external fixator, the lesion is found to be always maintained in distraction from ligamentotaxis (see Fig. 2a, b); no implant had need to be removed in advance of the execution of the definitive intervention, which occurred after a minimum of 4 days, maximum of 19; There were no significant intraoperative complications in the positioning of the apparatus nor problems during the execution of the definitive surgery, which was in 11 cases a circular external fixator (once in arthrodesis and 10 as stabilization in ligamentotaxis, associated with reduction and osteosynthesis at minimum), in 3 cases with hybrid External Fixation System, and in 22 cases an internal fixation with plate and screws (see Fig. 3a, b, c). Fig. 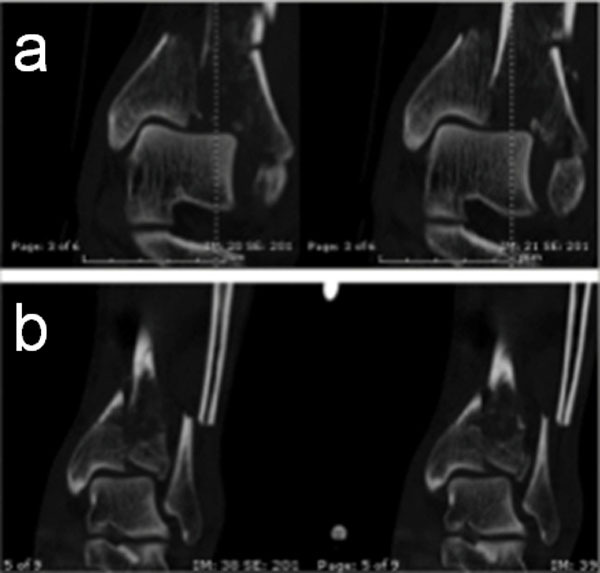 (2a, b) in the coronal CT images performed before (a) and after (b) the positioning of the external fixator; it is well evident alignment for ligamentotaxis achieved and maintained by the action of the assembly. The management of the distal tibia fracture is very difficult and with high complication rate. Postoperative complications concerned many patients and were mostly infectious or cutaneous problems and nonunions . (a) Radiographic images before temporary external fixation (b) Radiographic images after temporary external fixation (c) Radiographic images after definitive treatment. The soft tissues condition is one of the most important variables for the prognosis of tibial pilon fractures  and it is required a careful assessment of their state. The damage soft tissues quantification and the prediction of its evolution are difficult especially in the early stages; thus an open reduction and internal fixation in a suffering soft tissues (with edema) exposes to a high risk of complications such as infection and dehiscence of the surgical wound [4, 6]. Despite the fact that, when compared with Jones bandage, transcalcaneal skeletal traction improves the clinical conditions , the temporary treatment with skeletal traction may to be a problem, as it does not guarantee the complete stabilization of the soft tissues, it does not allow an optimal planning of the surgery because it's not possible to retain the traction during TC. It constitutes a source of pain and discomfort for the patient, that remains bedridden for several days, for which is limited only to special cases . P: Politrauma – I: isolated lesion. In past, authors suggested to use the definitive external fixation like a manner to reduce the risk of soft tissue damages, thanks to his minimally invasive approach; hybrid external fixation systems had additional advantages, because these are modular, easy to apply and allow early mobilization . More recently, some authors have found that definitive external fixation provided more malunion, stiffness or pain than ORIF and suggested that it not should be used as a definitive device . Today, the most effective strategy to treat the tibial pilon fractures is the ‘two-stages’ procedure: in the acute phase, the positioning of an external fixator in distraction to minimize the damage to the soft tissues by realigning the bone segments and definitive treatment after a few days, when the conditions of the soft tissues are defined [5, 10-14].The primary stabilization of these fractures should be quick and easy, but it must stabilize the skeletal lesion to neutralize the stress on the soft tissues. In this preliminary study, the "tripolar" configuration demonstrates to fully carry out these requirements in cases of tibial pilon fracture, both isolated or with fibula fracture; in fact, this configuration allows the facilitation of nursing and next diagnostic and therapeutic procedures; in particular, it is possible to have a better definition of the lesion with the TC study in distraction; the primary stabilization with this quick and easy configuration of the external fixator consents the achievement of these objectives with a commitment surgical reduced, with a simple sedation and without intraoperative fluoroscopy and therefore also in the emergency room, if the lesion is closed or low-grade exposed and not therefore requires an aggressive surgical debridement. The tibial and calcaneal fixator pins are in the same areas as for the use of the AO distractor that enhances and facilitates the ORIF: these two screws are distant from the skin incisions for the possible treatment with internal fixation, thus it is also possible that these screws can be left in place after sterilization with 95% isopropyl alcohol and povidone-iodine spray , before the preparation of the surgical field, with a further reduction of surgical time of definitive osteosynthesis. The mechanical stability of tripolar configuration external fixator may seem limited compared to more traditional configurations of external fixators, but this temporary fixation must be replaced within the next two weeks; in case it is not possible ORIF as definitive treatment, it must consider types of more stable assembly. None of the 36 cases treated with this new configuration of external fixation has had intraoperative complications and postoperative pain due to inadequate assembly. The “tripolar” configuration of temporary external fixator seems to be sufficiently able to stabilize the fractures of tibial pilon as well as required in the "two steps" treatment of these lesions. This represents a potentially very interesting technique, considering that it’s achievable without need of x-ray, operatory room and in simple sedation. Additional studies are needed to confirm these interesting preliminary results. ORIF (Open reduction, internal fixation). Destot E. Traumatisme du pied et rayons X. Paris: Masson 1911. Muller ME, Nazarian S, Koch P, Schatzker J. The Comprehensive classification of fractures of Long Bones. Milan, Berlin, New York: Springer-Verlag 1994. Coughlin MJ, Mann RA. Chirurgia del piede e della caviglia. Milano, Nizza 2001. Ruwe PA, Randall RL, Baumgaertner MR. Pilon fractures of the distal tibia. Orthop Rev 1993; 22(9): 987-96. Joveniaux P, Ohl X, Harisboure A, et al. Distal tibia fractures: management and complications of 101 cases. Int Orthop 2010; 34(4): 583-8. Sirkin M, Sanders R, DiPasquale T, Herscovici D Jr. A staged protocol for soft tissue management in the treatment of complex pilon fractures. J Orthop Trauma 2004; 18(8)(Suppl. ): S32-8. Martínez Otero A, Mafara Flores G, Rodríguez Ramírez S, Martínez Flores L. Preoperative management with skeletal traction in distal tibial fractures. Acta Ortop Mex 2007; 21(1): 14-9. Falzarano G, Medici A, Grubor P, Grubor M, Meccariello L. Emergent hybrid external fixation for tibial pilon fractures in adults. J Acute Dis 2015; 4(4): 322-5. Lerner A, Stein H. Hybrid thin wire external fixation: an effective, minimally invasive, modular surgical tool for the stabilization of periarticular fractures. Orthopedics 2004; 27(1): 59-62. Egol KA, Wolinsky P, Koval KJ. Open reduction and internal fixation of tibial pilon fractures. Foot Ankle Clin 2000; 5(4): 873-85. Dickson KF, Montgomery S, Field J. High energy plafond fractures treated by a spanning external fixation initially and followed by a second stage open reduction of the articular surface. Injury 2001; 32: SD92-8. Blauth M, Bastian L, Krettek C, Knop C, Evans S. Surgical options for the treatment of severe tibial pilon fractures: a study of three techniques. J Orthop Trauma 2001; 15(3): 153-60. Bacon S, Smith WR, Morgan SJ, et al. A retrospective analysis of comminuted intra-articular fractures of the tibial plafond: Open reduction and internal fixation versus external Ilizarov fixation. Injury 2008; 39(2): 196-202. Barei DP, Nork SE. Fractures of the tibial plafond. Foot Ankle Clin 2008; 13(4): 571-91. Oh JK, Hwang JH, Sahu D, Jun SH. 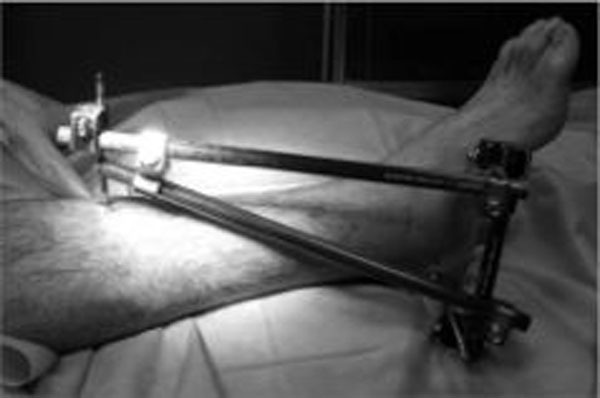 Complication rate and pitfalls of temporary bridging external fixator in periarticular communited fractures. Clin Orthop Surg 2011; 3(1): 62-8.